Please call owner Bill at 208-420-2115. Boat Location: San Diego, California. This wide body Sharp/Defever is in immaculate condition. She is fully equipped to head off shore. Her unique layout is a huge plus. The galley is below leaving a large area for dining and entertaining. The salon is extra large, great for everyday living or entertaining. She sleeps six with comfort. Her aft master stateroom with private head has ample closets and cabinets. Her beautiful wood interior shows as new. Having Keypower Stabilizers gives her the most comfortable ride possible. The Keypower Thruster sure makes docking a breeze. Pride of ownership is apparent throughout. 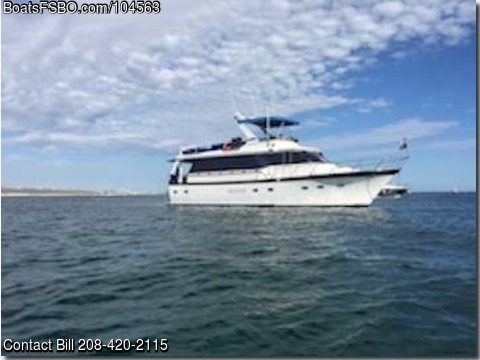 Builder: Tania Yacht Company Designer: Douglas Sharp LOA: 55 Feet (overall 58.5 feet with swim grid and anchor pulpit) Beam: 15.5 feet Draft: 4.5 feet Engines: Twin Caterpillar 3116 DITA Diesels, 300 HP each Port Engine: 2619 hours, Starboard Engine: 2620 hours Transmissions: Twin Disc MG 507. Tankage: Fuel Tanks: 2 tanks @550 US gal, 2 tanks @64 US gal Water: 300 US gal Holding Tank: 80 US gal. Engine Room: • 2 Parker Hydraulic pumps (front engine mounted) • 2 1/4" shafts • Four welded aluminum fuel tanks • Fuel Transfer/Polishing System • 300 US gallon water tank • Keypower 9 sq ft hydraulic roll stabilizers • Keypower KP10 15 hp bow thruster • Hynautic dual station helm controls • 2- 220v engine room exhaust fans • 2 12 v engine exhaust fans • HRO 600 gallon per day Reverse Osmosis water maker • 80 US gallon Black Water tank • 28 gallon Seaward hot water tank • Eurotech washer/dryer Bilge Pumps: • Whale manual pump in engine room • 5 12 volt electric bilge pumps. Electrical: • 12/115/230V • 7 Lifeline Absorbent Glass Mat deep cycle batteries • 14K va Marque Magnetics 10% step up transformer • 9K va Stamford hydraulic generator • 230V-50 amp shore power connections • Onan 12 MDL3P 12 Kw diesel generator • Xantrex Freedom 2500 watt Inverter/Charger Electronics: • Furuno GP 32 GPS • Furuno 1823-24 mile radar • Standard Horizon GX2360S VHF/Loud Hailer/Fog Horn • Standard Horizon Intrepid VHF • Icon IC-706MK11G single side band VHF • Eartec portable handheld radios • SCS PTC-11 ex pactor 3 receiver • Comnav 1101 Autopilot • Raymarine ST 60 sounder • Autohelm TRIDATA sounder • Skymate satellite email system • Viceroy barometer • Ritchie Compass. Deck Equipment: • Steelhead SM 1000R hydraulic deck crane w/power supply • Maxwell 3500 electrical anchor winch • CQR 30kg anchor • Bruce 30 kg anchor • Danforth 22kg anchor • 400' 3/8" galvanized chain • Paratec 24" Sea anchor w/450' chain and line • 10' Sorenson dinghy • 15 hp Yamaha outboard • Nautical Structures 6 step boarding ladder • Fenders • Fire and safety equipment. Master Stateroom: • Queen size center island bed • Full size head with tub and shower • Vanity w/sink • High quality cabinetry throughout • Full height closet • Recessed lighting throughout • 15" flat screen tv. Forward stateroom: • 2 single berths • full height closet • head with vanity • Beautiful cabinetry throughout. Mid Stateroom: • 2 single berths • full height closet • built in desk Main Head forward, full shower, vanity. Galley: • Lots of storage • Granite countertops • Bosch 5 burner 230v counter top electric stove • Siemens 230v Convection/Radiant heat oven • Siemens stove hood/exhaust blower • GE 14 cu ft refrigerator/freezer • Kenmore microwave • 2 basin porcelain sink. Salon: • 40" Sanyo flat screen tv • Entertainment Center- JVC VHS tape player, 5 disc CD player • 7 Bose surround sound speakers • 2 Leather love seats • single leather chair • Dining table w/6 chairs • Large windows with cellular shades • 5 cu ft deep freezer.